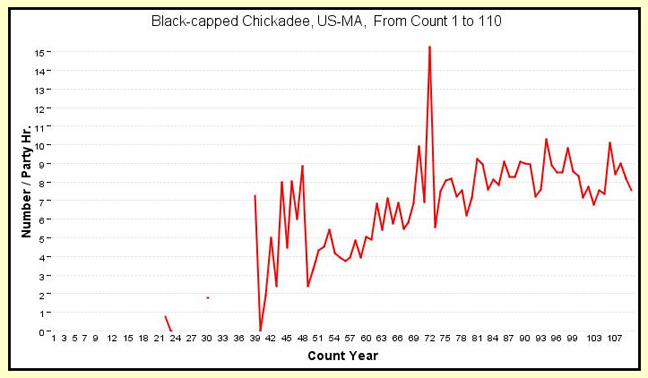 Yesterday (Monday) I was reading the Boston Globe and came across an article by David Abel about a recent report by the Audubon Society on their Breeding Bird Survey, and how it was showing that the changes in the climate was influencing bird ranges and populations. The surveys, which looked at the state of Massachusetts, only went back to 1965, and so, being curious, I wrote to Mr Abel pointing out the drop in temperature (about 4 deg F over 1950 - 1965) for the state that I wrote about a couple of weeks ago. I was, sort of hoping that he might look at the survey data before that date, and see if the bird populations had fallen with that temperature drop. Also I wanted to know if the numbers had returned the the 1950 level. However he merely sent me a note thanking me for my note. 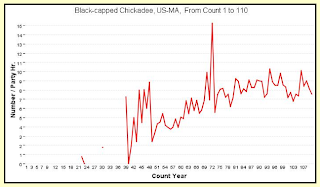 But I was now curious to know the answer, and so I had a look for the data on which the Audubon article and the resulting newspaper story were based. And it turns out that the reason that the data only went back to 1965 is that when the BBS started to be implemented). So where could I go to get earlier data? So the first thing to do was to get the basic information on the population with time, looking at the annual counts for the different states along the Atlantic shore from the Audubon site. And that showed the answer to one of my questions. 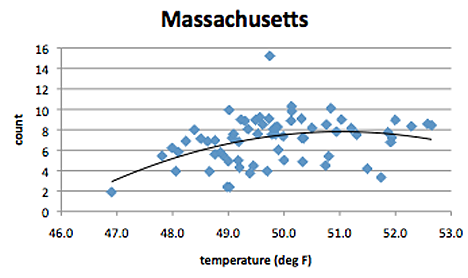 Let me begin by repeating the temperature plot for Massachusetts over the last hundred years from my look at the state. (I am using the USHCN numbers for this particular study) so that you can follow how I got there. 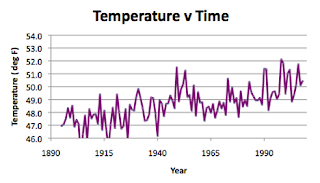 You can see the significant drop in average state temperature that occurred in the 1950 - 1965 time frame. So how did the bird population respond? The count doesn’t look that valid before 1940, and when I checked other states I had the same problem, so I am going to restrict the rest of this to the years after 1940. 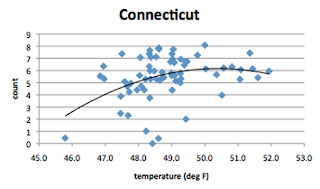 You can see that there was a drop in the count at around the period that the temperature fell, and this was confirmed when I looked at the numbers for the other states sitting close to Massachusetts. But, as you can see, the question that I had asked David Abel as to whether the numbers had returned to the values back before the temperature fell, was answered with a Yes! The plot showed, when I fitted a polynomial, that there was an optimal temperature for the population. I checked this with similar plots for the states along the Atlantic that I covered in the earlier post. 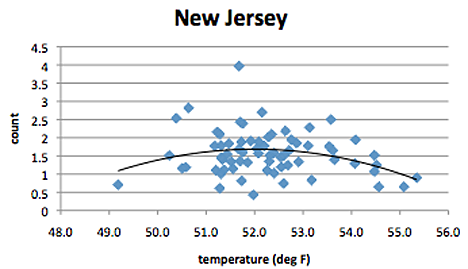 Some states didn’t get that warm, and some didn’t get that cold. 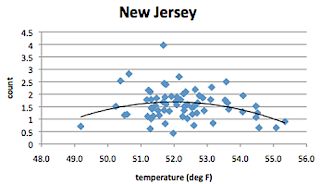 But for New Jersey, Connecticut, Pennsylvania, Rhode Island and perhaps New York, the data plots showed about the same peak in population at around 51 deg F.
So with Massachusetts temperature hovering around that level at the moment (as back in 1950) we’ll have to hope for no more change in state temperature, since too much fluctuation either way may cause the population to drop. So the next question would be whether the population drop is because the birds died off, or moved, if the temperature fell off. I don’t have enough data to answer that part of the question, but I have an indication. 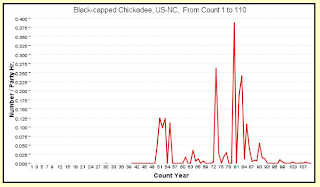 If one looks at North Carolina (below which the more Southern states don’t see this species apparently) then when that cold spell hit, further North, the state suddenly saw birds appear. (And having discovered the state they came back when it was colder up North). 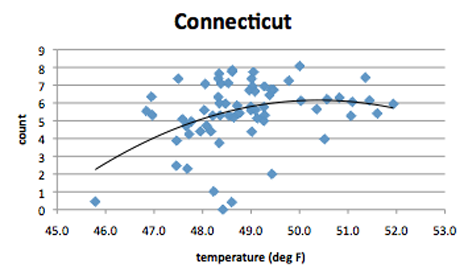 So it appears that, not only did I get an answer to my question, I also discovered another temperature index through the birds, and so maybe I’ll do some more correlations from time to time. 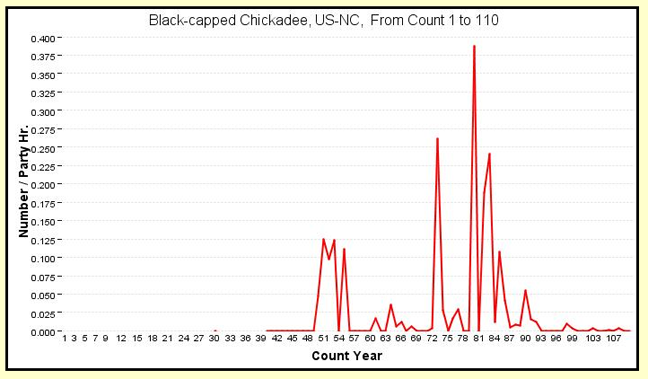 (I was thinking about doing wild turkeys since they are common around much of the country, but there is the problem that they are harvested also so that the numbers are more artificial). 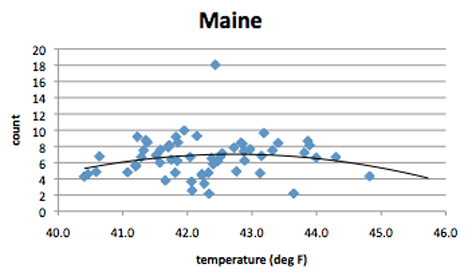 Oddly the plot of optimal temperatures for the Chickadee did not work for Maine, where the temperatures are cooler. Wonder if the Maine version is turning into a slightly different creature – given that it is the Maine state bird too. As a birder and a die-hard AGW skeptic, your article is interesting but I am not really sure any substantive conclusions are reached. I was a regional breeding bird atlas co-ordinator for the our atlas that finished up 2 yrs ago in Penna. 1. Comparing previous breeding bird atlas to recent one- "the report identified that 60 percent of state birds were increasing, 24 percent declining, and the rest were deemed stable." 60% increasing vs 24% decreasing. That's sounds good to me! 2. For NA Breeding Bird Survey - 50% decreasing vs 33% increasing. A decrease but not as large an increase as in breeding bird atlas. 3. For CBC - I believe he writes 60% increasing vs 25% declining. What's wrong with that? As to winter MA temperatures? Again, I don't see a worry. 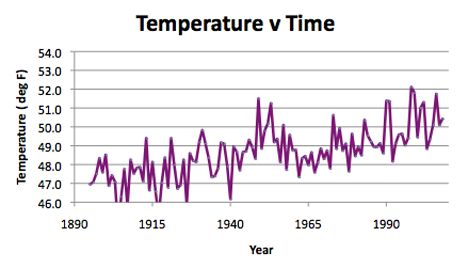 Plot winter temperatures from 1950-2010, 60 years, and the result is basically flat. 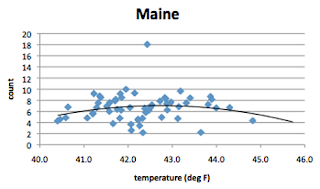 There is even a negligible decrease of MA winter temp's in the past 20 yrs. OGPSS - Can Alaskan coal be considered a reserve? OGPSS - NPRA and ANWR, will they help TAPS?